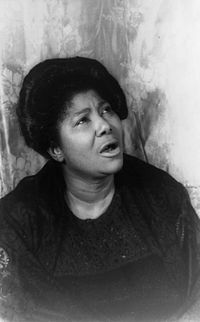 Mahalia Jackson (October 1911 - January 27, 1972) was an American gospel singer and musician. She was born in New Orleans. She had many hit songs during her career. She was in Evergreen Park,IL in 1972 when she died. She lived with her Aunt Duke when her mother died in 1917. She started to sing at Mt. Moriah Baptist Church at the age of 12. This page was last changed on 28 January 2017, at 20:09.